This cruise we just finished had a fun twist. There was a Rock revival on board. Themed, "Rockin" The Caribbean", The week featured performances by the likes of Freddy Cannon, The Tokens of "Lion Sleeps Tonight", a song that has sold 13.5 million copies. Lead singer, Jay Siegel, still sings the song in the original key and still carries the purity of the falsetto. Amazing. There was Lenny Welch singing "Since I fell For You", and The Elegants with "Where Are You Little Star". Gary Lewis and the Playboys, Bowser of Sha Na Na and a number of others also. The main performance and back up band, Rocky and the Rollers, with Bowser, put together these cruises four years ago. They have been sell-outs, every time. Rocky and the Rollers is a group made up of Boomer age studio musicians that were involved in many 50's and 60's recording sessions. If some of the acts faltered in performance from the doings of time, they still delivered enjoyable nostalgia. Those that were still good, were wonderful to hear. Part of our fun was the Karaoke contest. 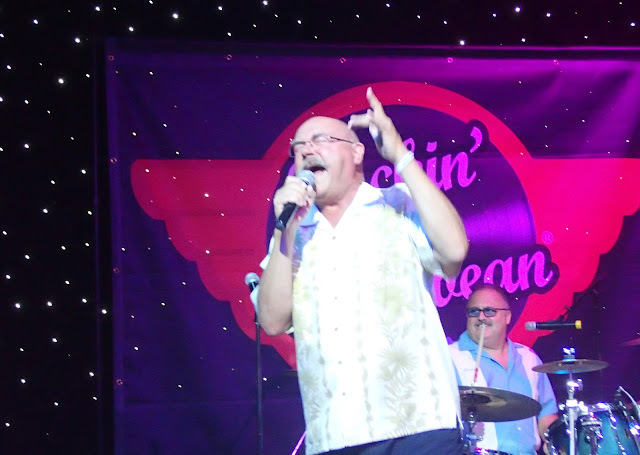 The winner got to sing with the band the last night of our week cruise. But here is a pic of me on stage with Rocky, the drummer. I'd guess wife Cathy will add more pics to come.